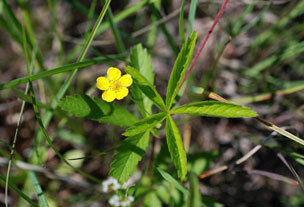 Also Called: Common cinquefoil, old-field five-fingers. Stems: Initially erect or ascending, later prostrate, arching or rooting at tip, sometimes reddish, branching, stiff-hairy. Leaves: Alternate, palmately 5-foliolate, occasionally 3-4-foliolate, stiff-hairy; leaflets oblanceolate, to elliptic, .8 to 2.8 inches long, usually less than 1/2 as wide; upper surface green, lower surface sometimes whitish; margins sharply toothed; stalks long, spreading-pubescent; stipules conspicuous, .2 to 1.2 inches long. Inflorescences: Solitary flowers on slender stalks from axils of leaves. Flowers: 2/5 to 3/5 inch broad, yellow; bracts subtending calyx 5, narrower than but nearly as long as sepals, alternating with sepals; sepals 5, triangular-lanceolate, 1/6 to 1/4 inch long; petals 5, egg-shaped, 1/6 to 1/4 inch long, yellow, tips rounded or with slight notch; stamens 20. Fruits: Head of achenes; achenes tiny, somewhat kidney-shaped, yellowish-brown, glabrous, obscurely ribbed, enclosing 1 seed. Habitat: Dry, sandy or rocky open woods, prairie hillsides, fallow fields, roadsides, fence-rows, and waste places. Uses: Native Americans used a tea of steeped roots to treat dysentery, fevers, and stomach ulcers. It was also used as a gargle to treat sore throats and gum disorders. Related to Sulphur cinquefoil .